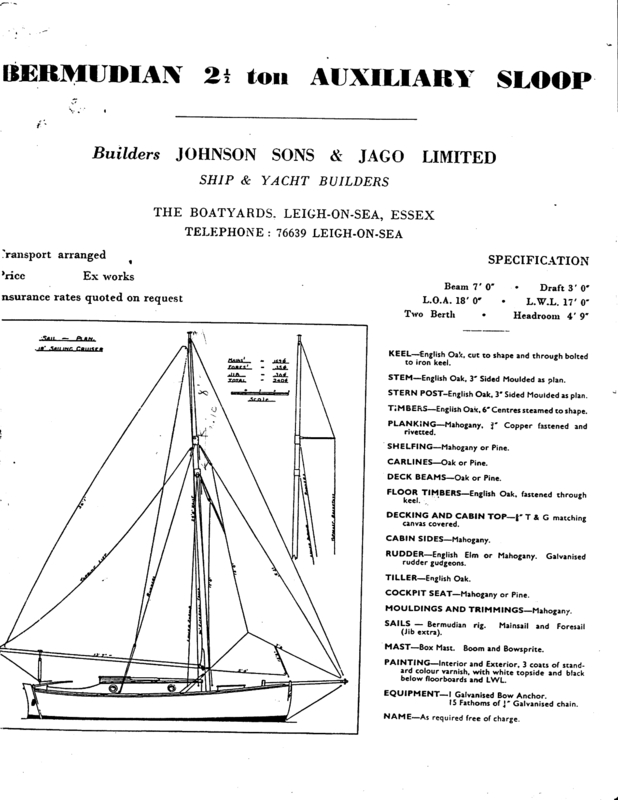 Following the post appealing for a new owner to care for a Johnson & Jago 2 1/2 tonner the other day, kind intheboatshed.net reader Julian Fouser has sent me this scan of a sales flier produced by the company. It looks like a sweet little boat. I gather there was a piece in Classic Boat some years ago in which someone offered one of these boats named Whistler to a good home in return for a donation to the RNLI. I hope she got the care she deserved and is still around somewhere. On the subject of Johnson & Jago-built boats, Google found me this site full of photos of a larger boat produced by the company – and this one is a Dunkirk Little Ship! Don’t miss something good: start receiving the weekly intheboatshed.net email newsletter now! Hi, just to let readers know that I have taken on the restoration of the Johnson and Jago 2 1/2 tonner. I have previously restored and still own Dorothea, a Falmouth Quay Punt built in 1909, and the J & J is in much better condition. I previously owned Jappa built by Johnson and Jago, a Maurice Griffiths design, referred to as the Cockler or Jappa class, now believed to be in the Med. I would be very interested in any information Julian Fouser or anybody else has about these yachts. I owned Dorothea from 1970 until I went abroad in 1978. I would be most interested in knowing how and what she is doing. I have a wonderful model of her. Tony Addis. I’ve had ”Matilda Mary” for 8 years or so. She’s a J&J 2 1/2 tonner, built in 1951, and was rescued by a former owner from a garden in West Mersea, Essex. She was at Pin Mill when I got her and after an extensive rebuild, she’s now afloat at Brightlingsea. As a hire yacht in the 60’s she must have been well known in the region, and I wonder if anyone may remember her. Would love to correspond with other owners. Wonder how many of the boats survive. My wife and I chartered Matlida Mary twice from Fairways of Maldon, once in Aug 1970 for a week as part of out honeymoon, and again for a week in about Aug 74.